While any regular visit to the dentist is important, it’s perhaps the first few visits in life that are the most crucial. Not only can preventative care be applied to save some toothaches down the road, but by establishing a positive relationship with dental visits early on, the unrealistic dread of visiting a dentist later in life will never be a problem. If you’re looking for a pediatric dentist for a young one in your life, you don’t have to look very far in Iowa. Spread across the state a long list of professional pediatric dentists can treat your child right. To get a little insight on some of the best, be sure to check out these 10 best kid-friendly dentists in Iowa. Believing that a child’s first visit to the dentist is the most important one, the Iowa Pediatric Dental Center of Coralville ensures every child’s visit is fun and engaging. 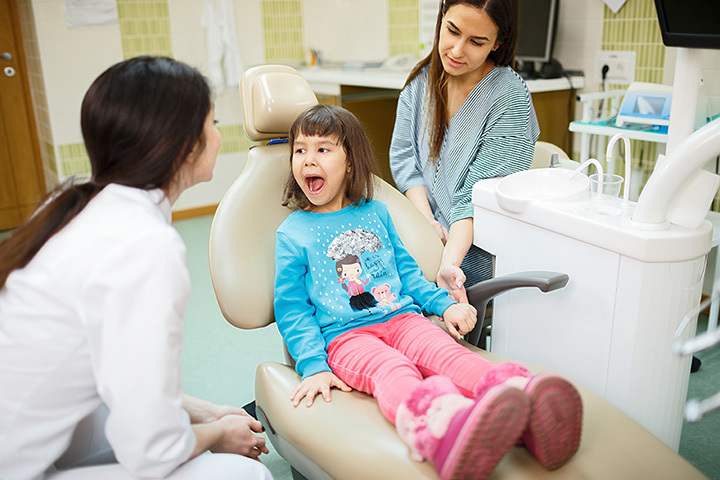 Besides a whole host of positive distractions including books, toys and play structures, Iowa Pediatric Dental Center provides professional and gentle technicians to make sure every child is comfortable in their seat. Catering towards children, adolescents and those with special needs, you will find no more qualified pediatric dentists than can be found at the Cedar Rapids Pediatric Dentistry in Cedar Rapids. Specializing in not only pediatric dental care, but also in creating a kid-friendly space, it’s the overall experience of visiting the Cedar Rapids Pediatric Dentistry that will set up children to be good dental patients for life. No other pediatric dental center in Iowa has as much experience in pediatric laser dentistry as the Children’s Dental Center of Central Iowa. A great solution for a variety of problems including tooth decay, canker sores and tongue and lip ties, besides the laser techniques at Children’s Dental Center of Central Iowa, this kid-friendly establish also strives to make a fun and relaxing atmosphere for every child that walks through the door. The good people at Ankeny Children’s Dental take seriously the trust you have in bringing your children to their office, and it shows with every detail they provide to make kids comfortable under their care. Whether it’s the positive distractions and fun atmosphere, or the friendly bedside manner from the dentists and technicians, every child who walks into the doors of Ankeny Children’s Dental leaves with a fresh smile on their face. Piloted by “Dr. Matt” Pyfferoen, Pyfferoen Pediatric Dentistry is always happy to welcome new patients to their family practice. Alongside the clean and comfortable atmosphere presented in the Pyfferoen Pediatric Dentistry lobby and dental rooms, many years of professional practice and education can be found at the Pyfferoen Pediatric Dentistry. Customers from Ames and afar all trust the good hands of Dr. Matt, and if you are in the area, you should too. Located in Decorah and serving the children of northeast Iowa, southwest Wisconsin and southeast Minnesota, the Northeast Iowa Pediatric Dentistry is responsible for a lot of happy smiles. Specializing in infants, children, teens and individuals with special needs, every customer who visits Northeast Iowa Pediatric Dentistry feels at ease in the comfortable atmosphere. Specializing in ongoing dental care for infants, children, teens, and individuals with special needs, Schommer Dental specializes in keeping adolescents comfortable and concentrated on keeping their teeth healthy. Between years of professional practice and education, and a long reputation for quality care, Schommer Dental is one of the best pediatric dentists of Iowa. Making kids smile is what Children’s Dental Center of Mason City loves to do. Whether that is through the fun and engaging waiting room complete with a fish tank, or the quality service they provide to every smile, the Children’s Dental Center is the perfect place for a first dental visit. While a good smile is of course a priority, the overall goal of Children’s Dental Center is to build a positive attitude towards the dentist for years to come. Featuring a kid-friendly office complete with games, coloring books and plenty to look at, if you want your child to have a fun time visiting the dentist, Children’s Dentistry in Bettendorf is right for you. Besides the engaging time spent in the waiting room, through state-of-the-art technologies and years of professional experience, the time spent getting smiles worked on is as gentle as it can be. Serving all adolescents of southwest Iowa, Children’s Dentistry of Council Bluffs is all about growing smiles that will last a lifetime. Through their positive and kid-friendly experience, the dentists and technicians of Children’s Dentistry of Council Bluffs build a solid base for positive dental visits, and can provide the preventive care needed to make those visits fewer and potentially less painful. Check them out yourself and your child’s bright smile will be a reminder why Children’s Dentistry of Council Bluffs is one of the best in Iowa.